Eltronicschool. - This is one of the best project for you who want to develop your ability in Arduino programming and design in this time. This article will discuss to you about Arduino Nano for car speed detector. 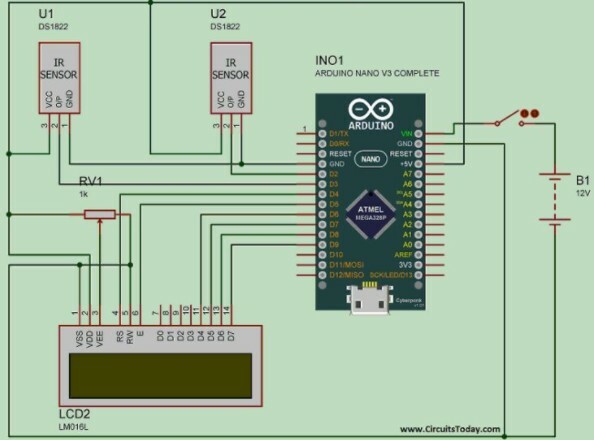 Beside we will give you the circuit schematic of car speed detector using Arduino Nano and also the simple description of this project, and the last we will give you the link to read more about this project from original source. Circuit schematic like in Figure 1 above is Car Speed Detector Using Arduino Nano. In this project I am going to show you how to measure the speed of running car (or man) from outside. Police department uses this type of system to prevent over speed of vehicles. Our project is a little different from the system used by police but the overall car speed detector concept is same. In this project, two IR sensors are placed apart on one side of road. When any vehicle crosses the sensors, the internal timer of Arduino counts the time between activation of sensor. Now speed is measured by using simple distance time relationship. And now you can read more about this article Car Speed Detector Using Arduino Nano from original source using link HERE.